Hi from Israel! Just got my first SURF4X last month looks wery professionaly made. one huge carpet nem and cleaning crew. The fish food is about 2 cubes per day mainly frozen, the corals and anemone once per week. Nitrofication cycle is already behind and now the whole system is on its algae cycle. The water parameters are stable based on regular dosage accordingly to the Red Sea mixed reef program. NO3=1ppm, PO4=0.01 with daily NoPOx dosage 3ml/100L . NO3=0.5 (dropped), PO4=0.01 (on the same level)...NoPox dosaing was down to 2ml/100L..
NoPox usage along to keep all present levels as is on the bay. The scrubber installed to the sump section running on 18h a day on the half lights on. During the fisrt week the half of the lights were also shaded black. After a little less than an one week passed there were a signs of the some growth. Where the lights were fully opened observed growth of something green on the strips and walls as well. My action were to get off black shade and keep running 18h a day light shedule. and what are my next steps? Any advise will be much appreciated. Less illumination causes darker growth. So you can remove all shade cloth now. And in another week, plug in high power light. Then in another week, take a picture of growth, and then it should be ready for cleaning. But let us see picture first. This is a situation of the actual growth after 14 days (see attached pictures). clearly shows some thin hair algae growth within its mass. and all look very happy. What is my next step? The harvest is already require? How many harvest, in the sink, full or partial will enough? Any detailed advise will always much appreciated! Just reach in with your hand, and easily pull out growth. Clean lid by scraping credit card on it, and replace for another 7 to 10 days. Keep 18 hours of light. 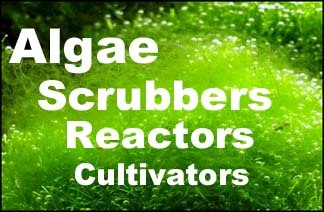 The scrubber looks like running well and the water test is excellent.. Attached pics of 8 days growth. The first is actual look, 2nd harvested algae, 3rd after harvesting..
You can do 20 hours. Clean whenever you need to, in order to get the most growth. Thank you SM for excellent made and working device. Very happy it worth every penny paid for. Passed about a week after the last scrubber cleaning I get noticed overal slowdown (about 50%) in the algae growth. Еhe first cleanup was needed after 3-4 days but now growth going very-very slow.. It's still keep growing but not so fast as in the beginning was. The algae mostly clings to the scrubber walls or to the stips ends..
First of all, I've noticed that air bubbles outlet is noticeable weak as well as discover partial blockage of the air tubes. What are your recommendations and what may be the reason algae rowth slowing down? Get back to 18h cycle, to half light power?? This is because nutrients have been removed from the water. You can feed more now if you want to.